Nikita Rath recently nominated me for the Very Inspiring Blogger Award. I have really enjoyed reading her blog about her travel adventures across the world. She was born in India and has been to several other very interesting places. I especially loved reading about her trip to Budapest. I was also quite thrilled to read that her favorite school subject was mathematics. I will write a few random facts about the number 480 before I list my nominations for the Very Inspiring Blogger Award. 480 is the sum of consecutive primes two different ways. 239 + 241 = 480; those 2 consecutive primes also happen to be twin primes. 109 + 113 + 127 + 131 = 480; that’s 4 consecutive primes. No counting number less than 480 has more factors than 480 has, but 360 and 420 each have just as many. 480 is the hypotenuse of the Pythagorean triple 288-384-480. 480 is the longer leg of the primitive Pythagorean triple 31-480-481. Since 480 has so many factors, it has too many other Pythagorean triples to list here. One of my readers gave another very interesting fact about the number 480 in the comments. Check it out! 480 is a composite number. The exponents in the prime factorization are 5, 1, and 1. Adding one to each and multiplying we get (5 + 1)(1 + 1)(1 + 1) = 6 x 2 x 2 = 24. Therefore 480 has exactly 24 factors. Even though Homeschoolpdx isn’t as comfortable with mathematics as she’d like to be, she has found some very good ways to teach her young children mathematical concepts using storybooks, games, cooking, gardening, and toys! Her children are already very good at math, and I am confident that they will continue to be. Life Through a Mathematician’s Eyes posted favorites for the month for April: favorite mathematical quote, favorite art and maths inspiration, favorite number, favorite mathematician, and favorite blog/pages/people. This blog is well written and quite pleasing to the eye and was the host of the 121st edition of Carnival of Mathematics. Lisa M. Peek wrote a post with a very intriguing title: 3-reasons-that-blog-posts-with-numbers-are-popular. She has noticed that blog posts with lists often go viral on facebook. She has given some thought about why that happens and gives some compelling reasons. Mopdog did the A through Z challenge on 26 Ways to Die in Medieval Hungary. I loved reading every single post. These are stories familiar to every Hungarian but are generally unknown to the rest of the world until these posts were written. A: by Adultery is the best place to start. Remember how fun it was to use your thumb and a flip book to make a cartoon character dance? Paula Beardell Krieg has spent months planning and preparing four wonderful flip books that teach and reach students who are learning to graph linear equations. She has even prepared pdf’s of the pages that can be downloaded and assembled. Complete instructions are given in the-animated-equation-book. Happy Easter! The song, “Because He Lives,” is especially appropriate for Easter. The composer, Sally DeFord, has written some absolutely beautiful music. You can download PDF’s of ANY of her sheet music for FREE on her website. This particular arrangement is written for a duet, but there is also a version for SATB. There are PDF’s of this particular song translated into Spanish, Portuguese, and Finnish. One of the people who commented even gave a translation into Chinese. Since this is my 448th post, I’ll give some information about the number 448. 448 is another Harshad number because 4 + 4 + 8 = 16, and 448 can be evenly divided by 16. 448 is a composite number. The exponents in the prime factorization are 6, and 1. Adding one to each and multiplying we get (6 + 1)(1 + 1) = 7 x 2 = 14. 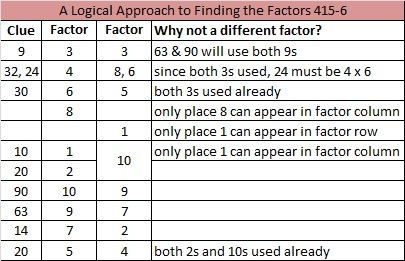 Therefore 448 has exactly 14 factors. 411 is a composite number. The exponents in the prime factorization are 1 and 1. Adding one to each and multiplying we get (1 + 1)(1 + 1) = 2 x 2 = 4. Therefore 411 has exactly 4 factors. When I first noticed that people were visiting my blog because they wanted to know the factors of a number, I resisted changing, but later I gave in. I even edited all my previous blog posts to include factored numbers. Eventually I added the square roots of numbers and indicated if those square roots could be simplified. Still I keep my original intent and publish the puzzles I create. Coming up with imaginative titles for EVERY blog post can be tedious or even impossible. Many people judge whether or not a post is worth reading by the title. Sometimes a great title pops into my head, but most of the time I’ve got nothing. I started giving my puzzle posts boring titles like “Level 3” and actually had several posts with that same name. When my stats page told me that someone liked or visited a post called Level 2, I wasn’t sure which post that was. When I started factoring numbers, it solved my problem of giving each post a distinctive title even if it was still a boring name. Now I often use unimaginative titles like “406 and Level 4”. Blogging uses up more time than you imagine it will. I once read a very long, hilariously funny, grammatically perfect post that the author claimed he wrote during his lunch time. I find that claim very hard to believe because it certainly doesn’t work that way for me. I can spend 15-30 minutes reading or writing blogs, but the clock at my house indicates that I actually spent two hours or more. No matter what clock I use, it’s the same story. If you write a blog, you will connect with a community of people who read your blog and you read theirs. All that reading takes time. Commenting on someone else’s blog or answering a comment on your own blog also takes time. It may seem like you’re only spending a few minutes at a time, but it really is much longer than that. Family members may complain about other things not getting done or quality time not being spent even if they are trying to be supportive. You will find blogs you want to read even though its writer doesn’t feel the same way about your blog. You will learn so much reading other people’s blogs, and you may want to read more books about a particular subject or even write about it yourself. You will find yourself wishing there were more hours in the day, or that you could actually make some money blogging and cut back on your hours at your regular job. Most bloggers don’t make money blogging. If you want to make money on WordPress, you have to have enough views, you have to purchase your own domain name, and you have to sign up for WordAds. After some consideration, I took this step in August 2014. I registered my domain name for $18 a year and signed up for WordAds. I also pay another $8 each year to keep my contact information private. How many views do you have to have to make money on WordPress? Update: Since writing this post, WordPress allows ALL of its bloggers to sign up for Wordads. Now every blog with a registered domain name is a potential money maker, even if it turns out to be just a little bit of money each month. The amount of money that you’ll make will depend on how many views you have and where those views come from. Was it worth it to register your own domain name? Yes, the number of views I’ve received after registering is much, much greater than it was before I registered. It is much easier to tell friends and acquaintances to look for Findthefactors.com than it was to tell them that name with wordpress added to it. Even though it cost more money than I might have made back, it helps me reach more viewers, and that helps me meet my original objective. The only drawback is that if don’t renew my registration every year Findthefactors.com could become what they call a parking lot. I would have no control over what people would see if they went to the site. If you read the fine print when you register your domain, this stipulation is made quite clear. Somebody else could put whatever they want on the unregistered site, including adult content. I intend to continue registering Findthefactor.com for the rest of my life. Hopefully my children and grandchildren will also after I’m gone. If you’re still thinking of starting a blog, do it because you love a particular subject. Do it because it pleases you. There will be days when absolutely nobody else looks at your blog. You will gain some followers, but some of those followers will get discouraged with their statistics and quit blogging and quit reading your blog. You will also get some followers who follow you for the sole purpose of trying to get you to follow them back. Once you follow them, they never look at your blog again. If you blog, you have to do it for yourself, and if anyone else enjoys it, that is a bonus. I chose WordPress because it allows me to put excel documents on my blog. (Blogspot didn’t.) Unfortunately people who view my blog on their smart phones can’t see those documents. I hope there are a few teachers out there who at least occasionally look at my blog on their home or school computers and print out the puzzles for their classes. That would make my decision to add those documents definitely worth it. Fellow bloggers, what other things do you think new bloggers should know? 338 is a composite number. The exponents in the prime factorization are 1 and 2. Adding one to each and multiplying we get (1 + 1)(2 + 1) = 2 x 3 = 6. Therefore 338 has exactly 6 factors. Starguy recently nominated me for this blue-green Liebster award. Many bloggers have a no award policy, and I can certainly understand why: receiving an award is a bit of work if you accept it. The Liebster award has been around for a long time, and it has been said that just about every blogger has received it at one time or another. As these images demonstrate, some recipients have changed the way the award looks. Since the logo has been changed multiple times by multiple people, I don’t feel bad having a somewhat rebellious attitude as I accept some of the qualifiers for the award while rejecting others. I’m not interested in sharing 11 random facts about myself, answering 11 questions, or coming up with 11 more to ask my nominees. I’m sure you will learn at least 11 things about me just reading this post anyway. (Random fact: I don’t like reading really long posts that go on forever, and this post will be long enough as it is.) If my nominees would like to write and answer questions, they can refer back to the questions asked in Starguy‘s post. The idea of the Liebster award is to help bloggers get out of their comfort zones and discover new blogs, and I have done that. In fact several of the blogs I mention in this post I discovered within the last couple of weeks. Even though I am an English speaking grandma, I listened only to Hungarian Christmas carols this year. Justkinga is a Hungarian teenage girl who listens to popular English music all year long. She takes TEN classes at a bilingual school, but somehow finds the time to write a delightful blog in ENGLISH regularly. I ADMIRE HER for writing in English even if there is an occasional grammar error or incorrect word choice. She also writes about Hungarian life and culture. Established1962 wrote about an ingenious way to make Snakes and Ladders a game of decision making rather than mere chance. In the process, he made the game something even older players would enjoy playing while they observe some subtle mathematics. Nebushumor wrote a very funny post about an extermination ad that featured an adorable Christmas mouse. Other times he’s written about Star Trek, funny family pet rabbit situations, classic cartoons, and comedy gags. Once a week he shares some kind of humorous statistics. Solvemymaths shared a great link showing multiple ways to prove the Pythagorean theorem. The 3-4-5 triangle that accompanies his post is far more than a simple illustration. Solvemymaths routinely posts a variety of math problems, gifs, computer programs, and pictures that can help you think and learn to solve your own math problems. Because I am a vegetarian, I was intrigued by notquitefrenchcuisine‘s old Hungarian family recipe for vegetarian burgers. I also love that she sprinkles a few Hungarian food words in her posts, too. When I first read Puzzled Over’s Ages-of-three-daughters, I wasn’t sure how the last clue could possibly help me solve it. Maybe it will stump you at first, too, but it really can be solved without too much trouble. One of the topics Classy Cheapskate blogs about is minimalism. She says a comfortable minimalist owns about 150 things. I can’t imagine that being possible for ANYONE right now, but I do want to head closer to that direction as does she. I loved Paula Beardell Krieg’s instructions on how to fold paper to make an-equilateral-triangle and other basic shapes. Her method uses the straight edge of a piece of paper, but no compass is needed. Elementary school children can even make perfect squares or triangles using her methods. Margarita Morris is a young adult author who has shared the complete writing process with her readers. Her books are well researched, written, and revised. She also shares her love of great classical music and can capture a scene in nature without writing a single word. Resourceaholic scours the internet for resources that teach mathematics. Every one of her posts is loaded with as much information as this link. Your students will learn more if you read her blog, and chances are you will learn something, too! Nerdinthebrain is a home-schooling parent who loves science and mathematics and sharing her lessons with us. Because of her, my grandson and I had a ton of fun testing the pH of different liquids using red cabbage water. She has MANY good ideas and products. The Chaos Fairy was also nominated for the Liebster Award at the same time that I was so I’m not counting this as one of my 11. Nevertheless, I just had to recognize the DINOSAUR loving in this blog post. 95 is a composite number. 95 = 1 x 95 or 5 x 19. The factors of 95: 1, 5, 19, 95. Prime factorization: 95 = 5 x 19. 95 is never a clue in the FIND THE FACTORS puzzles. In Hungarian, “Multiplication Table” and “Times Table” are the same expression as “Once Upon a Time”. I very much enjoyed learning that when I went to the school of fairies today where even butterflies can learn to multiply. The author translates a sweet poem from Hungarian into English. I hope you will read the poem and remember its encouraging words whenever you try to solve one of my multiplication table puzzles or any other task that challenges you in life. 73 is a prime number. Prime factorization: 73 is prime. The exponent of prime number 73 is 1. Adding 1 to that exponent we get (1 + 1) = 2. Therefore 73 has exactly 2 factors. How do we know that 73 is a prime number? If 73 were not a prime number, then it would be divisible by at least one prime number less than or equal to √73 ≈ 8.5. Since 73 cannot be divided evenly by 2, 3, 5, or 7, we know that 73 is a prime number. 73 is never a clue in the FIND THE FACTORS puzzles. Shortly after I started blogging, Steve Morris found me and became a leader in my cheering section. Even after the number of HIS followers grew exponentially, he still finds some time to show me support. Here he writes an entertaining and encouraging post titled How To Get More Blog Followers that I think all bloggers should read. It has a mathematical element to it and could help you increase the number of people who read your blog even if your own mother isn’t one of them. 67 is a prime number. Prime factorization: 67 is prime. The exponent of prime number 67 is 1. Adding 1 to that exponent we get (1 + 1) = 2. Therefore 67 has exactly 2 factors. How do we know that 67 is a prime number? If 67 were not a prime number, then it would be divisible by at least one prime number less than or equal to √67 ≈ 8.2. Since 67 cannot be divided evenly by 2, 3, 5, or 7, we know that 67 is a prime number. 67 is never a clue in the FIND THE FACTORS puzzles. 43 is a prime number. Prime factorization: 43 is prime. The exponent of prime number 43 is 1. Adding 1 to that exponent we get (1 + 1) = 2. Therefore 43 has exactly 2 factors. How do we know that 43 is a prime number? If 43 were not a prime number, then it would be divisible by at least one prime number less than or equal to √43 ≈ 6.6. Since 43 cannot be divided evenly by 2, 3, or 5, we know that 43 is a prime number. 43 is never a clue in the FIND THE FACTORS puzzles. So far today FIND THE FACTORS has received nearly four times as many views as its previous high. When I investigated why I discovered one of the reasons was a blog called mathematicsgames.wordpress.com. 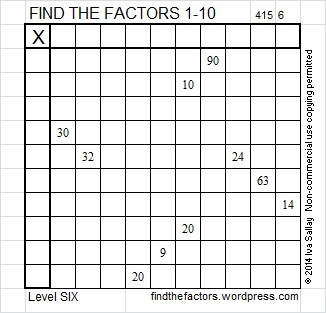 On that blog was this post recommending the FIND THE FACTORS puzzles. I am excited for the great write-up and the new people who have looked at the puzzles and used the excel file I made! I am humbled that mathematicsgames wrote the post, and I’m also quite proud to tell you about it.